Terms and Conditions apply. New players only. 18+. 35x wagering applies to Bonus Cash and Free Spins. 100 Starburst Free Spins and 5 Free Spins a day for 20 days credited after deposit & wager of £20+ on slot games. Gambleaware.co.uk. Blackjack is a game that may look simple on the outside, but beneath the surface you’ll find that it’s all about odds and making the correct mathematical decisions. It’s easy to let your intuition take over and base your decisions at the table on that. 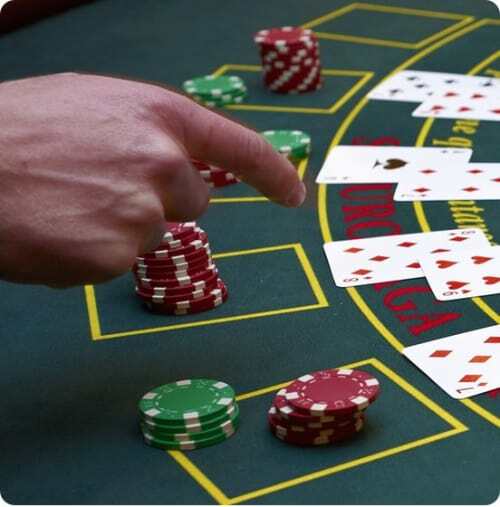 To be able to play perfectly and master blackjack, it is however crucial to understand what the odds are for every scenario you face and only base your decisions on those odds. It’s important to be aware of how the house is getting an edge in the game and what advantages us players have to our disposal, which can be used to lower the house edge. In the following article we’ll be covering the basics for the optimal blackjack strategy, known as basic strategy, which makes it possible to lower the house edge a great deal. We’ll take a look at how the house is getting its edge; what our own advantages are; give a few examples on the odds on certain outcomes and show you how basic strategy is applied at the tables. The goal is to create a good understanding of the importance of odds and how the use of basic strategy can help you improve your game when you’re playing for real money. As with all casino games it’s inevitable to get away from the fact that the house has an edge on us players. Even if you master blackjack and learn how to take all the right decisions using basic strategy, it’s important to be aware that the house will still have an edge and win in the long run. The exception would be if you played perfectly and also learned how to count cards as you actually could get a slight advantage. The reason that the house always has an edge on us players in blackjack is the simple fact that we have to act first at the table. Every time we hit a card and bust, which happens about 28% of the time, we will lose even though it turns out the dealer busted as well. This is the huge advantage the house has on us, which is that big that we normally can’t beat it. Even though we can’t beat the house, we have all the tools needed to drastically lower its edge. As a starting point the house has an edge of 8% on us players, but by using the optimal strategy, basic strategy, we’re able to lower this down to as little as 0.2-0.5%, depending on what the rules are at the table. This is done by using the advantages that we players have at the table in a mathematically correct way. Even though the dealer has a huge advantage by always acting last, we players do after all have a lot of alternatives that can be used to our advantage, which the dealer doesn’t. It’s these alternatives that make it possible for us to perfect our game so that the house edge can be drastically lowered. Every time we manage to hit 21 and get a blackjack, we get paid extra as this pays 3:2 (2.5 times the stake), as long as the dealer doesn’t also have 21 as we would then just get our stake back. We have a lot of options with our hands as we’re always allowed to choose if we would like to stand or hit, whereas the dealer is extremely limited and forced to hit on all card combinations up to a value of 17, no matter if the dealer has us beat with a lower hand value. We’re able to use a double down feature that allows us to double our stake at times when it’s to our advantage, hence being able to maximize our winnings from those moments. We can choose to split pairs, which makes it possible for us to improve weaker hands and also take advantage of the dealer’s weak ones. Even if it’s not always offered, we sometimes have the possibility to surrender our starting hand and get half our stake back. In the long run this can save us money and the dealer never has this option. 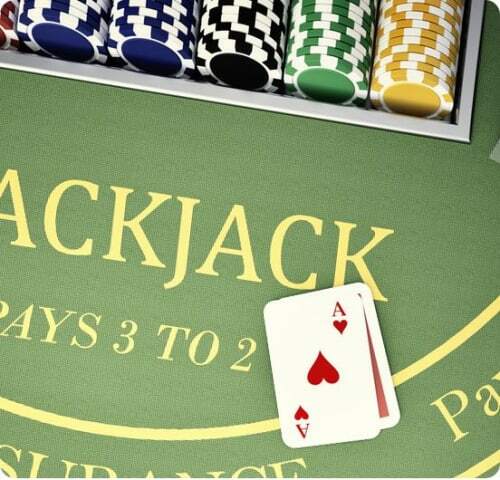 The key to becoming a successful blackjack player lies a lot in the understanding of odds and probabilities. No matter what cards you have been given and what situation you face at the table, it’s incredibly important to be aware of the chance of winning and probability of busting. Without any deeper understanding of odds in blackjack, it’s easy to believe that hitting on a hand value of 12 would always be the right decision. This is because 12 is a very low value and the fact that more than two thirds of the cards in the deck(s) would improve the value of it. Even though you got a weak hand, the dealer could also have a weak one (i.e. a six), which means that the dealer would have a high probability of busting. Only focusing on your own hand is a very common mistake as the dealer’s probability of busting is just as important to have in mind. As you can see in the table above, the dealer has a 42-44% probability of busting when being dealt a six, which is very high. Because of this, it’s actually always the mathematically correct decision to stand if you have a hand value of a hard 12 (12 without an ace in the hand) when the dealer’s showing a six, unless you’re looking down at two 6s as a split would be better. In the long run you’ll unfortunately always lose money at a scenario like this as you have the odds against you, but by choosing to stand you’ll lose less hands than you would by hitting. As previously mentioned, us players have several alternatives to use at our advantage to be able to lower the house edge. All of these alternatives are however not available to use whenever we like and therefore there’s a very important order to follow when playing optimally using basic strategy. Below you’ll find questions that you should ask yourself in every hand you’re dealt, as well as in what order you should be asking them. Can I/should I use surrender? Can I/should I double down my hand? Should I stand or hit another card? It’s very easy just to focus on whether or not you should hit or stand, but this is always the last thing you should think of, after asking yourself all of the above questions. To be able to play perfectly by using basic strategy, your last decision should always be if it’s to your advantage to hit an extra card or if it’s better to stand. 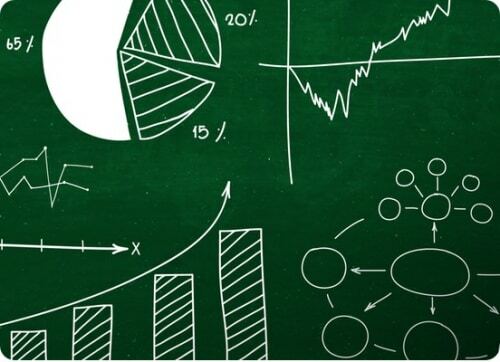 With the information we’ve presented in this article we’ve hopefully managed to give you a good understanding of the importance of odds in blackjack. You’ve also received information and knowledge about how the use of basic strategy allows you to play optimally and improve your chances of winning over time. This unfortunately won’t make you unbeatable in blackjack, but it will surely reduce the number of losing sessions you have. It’s now time to dig deeper into basic strategy and learn everything about when it’s mathematically correct to surrender a hand; when you should and should not split your pairs; when the right time for using the double down feature is, as well as for which scenarios it’s correct for you to stand and when you should be hitting an extra card. Start your journey at Mr Green today!